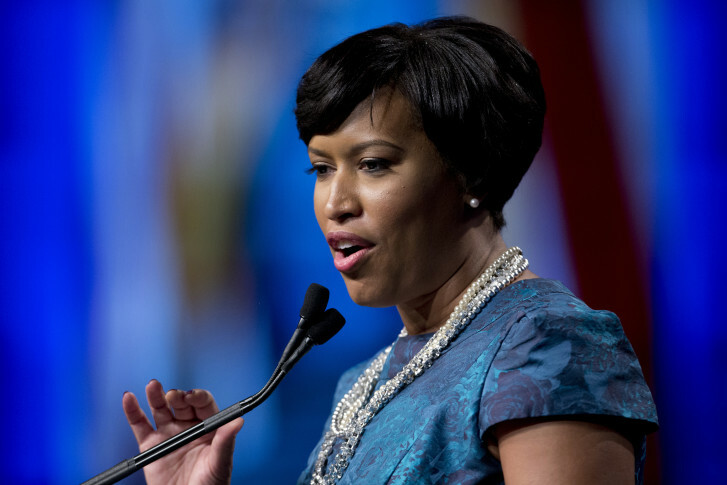 WASHINGTON – D.C. Mayor Muriel Bowser took to the national media on Thursday night to deliver a straightforward message regarding marijuana legalization in the District, and to stump for D.C. statehood. On MSNBC’s “The Rachel Maddow Show,” host Maddow ran down the recent conflict between Republican congressmen on the House committee that oversees D.C. and the District government in the wake of the passage in November of Initiative 71, which legalized the growth and use, but not the sale, of marijuana. Jason Chaffetz, of Utah; Andy Harris, of Maryland, and Mark Meadows, of North Carolina, have been outspoken in their disapproval of Initiative 71, going so far as to threaten Bowser and other government officials with prison and to demand the names and other information of District employees who help to implement the law. Maddow asked whether Bowser foresaw other types of retribution coming from Congress. Bowser replied, “The Congress well knows how to stop things when they want to stop things,” referring to Congressional moves to block abortion laws, clean needle exchanges and medical marijuana. When Maddow pointed out that the question of what is and isn’t allowed in D.C. was complicated, Bowser quickly interjected, “It was complicated by Andy Harris. “The voters were very clear in what they wanted to approve: home growth, home use by adults, although she added, “I think it was the expectation” that the council would be able to pass some regulations regarding the sale of marijuana.